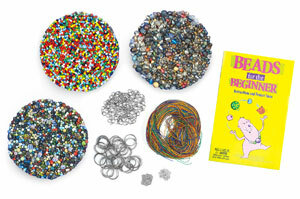 Everyone gets to try beading with these economical kits! Both include instruction booklets that show students how to make a clasp necklace, clasp bracelet, cord bracelet, cord necklace, and more. Class Pack of 30 — This class pack includes 30 instruction booklets, 60 lobster clasps, 30 yards of tigertail wire, 120 crimp beads, 60 jump rings, 30 headpins, 60 precut cords, 1 lb of glass E-beads, and 4 lb of mixed glass beads. Class Pack of 8 — This class pack includes 8 instruction booklets, 16 lobster clasps, 30 yards of tigertail wire, 40 crimp beads, 60 jump rings, 10 headpins, 3 colored cords, 6oz of glass E-beads, and 1½ lb of glass beads.